AUP Global | President Celeste Schenck - The View From AUP - November 2017! President Celeste Schenck - The View From AUP - November 2017! Our late and long summer in Paris has now officially given over to fall, and I’m behind in getting this missive out to you. What a busy rentrée it has been with the launch of the renovations on our spectacular Quai d’Orsay learning center, and a harvest of conferences, films, debates, and roundtables on campus in the first six weeks of the semester. President Macron has launched his economic and labor reforms. AUP’s dedicated and active Board has come and gone for very successful and celebratory board meetings. And we’ve scored our first French accreditation—this for our Master’s Program in Global Communications. We also have our largest freshman class ever, and a full 1134 students on campus, holding 103 nationalities and speaking 63 languages. I have just returned from Poland, having accompanied the AUP study trip to Warsawwith Brian Schiff (Psychology) and Charles Talcott (Global Communications), along with a group of 24 curious, attentive, open students ranging from freshmen to study abroad visitors to seasoned graduate students. What a pleasure it was to be a student again! I hadn’t been on an AUP study trip for about 15 years since I last led one myself to Florence and Bologna. Those four days, bringing me so close again to what we do best at AUP, let me see anew our educational mission in action. Constance Pâris de Bollardière, the post-doc archivist of our George and Irina Schaeffer Center for the Study of Genocide, Human Rights and Conflict Prevention, whose research focuses on Polish Jews in France, did the advance planning; and Brian and Charles forged a beautiful educational arc for this difficult trip. 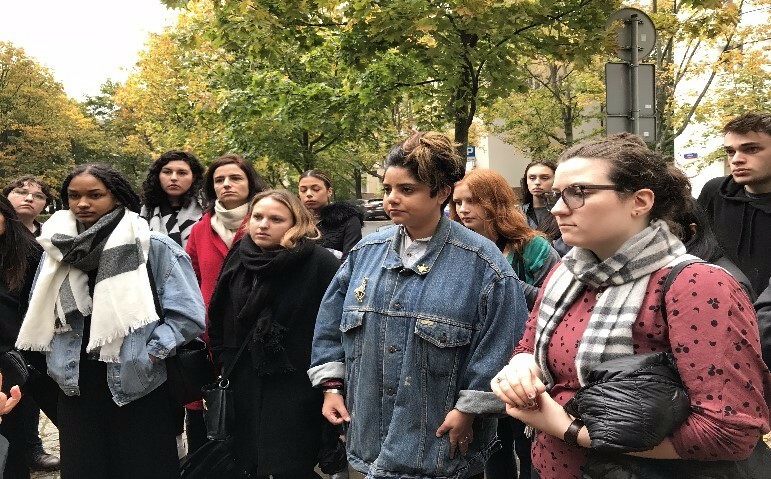 We began with a walk through Jewish Warsaw and the Ghetto, and a guided visit through the spectacular, immersive POLIN Museum that chronicles a thousand years of Jewish history in Poland. Not only did we hear the “official” version of the museum’s intended narrative, we also walked around the grounds with a brilliant Polish professor, receiving from her a counter-narrative about the truths that memorialization can obscure. In the cramped basement rooms of the museum representing the Holocaust, we prepared ourselves for the next day’s trip to Treblinka. On a gray, drizzly day in October, we were the only people there to memorialize the loss of 1300 Jewish communities, nearly a million people. I was struck, as we wandered through the deeply moving memorial site where nothing remains today of the extermination camps, how each student found his or her way to “be” in such a place. It brought us very close together indeed, Jewish and non-Jewish students alike, and provided a setting in which we could explore our commonalities. One student spoke of his grandparents’ flight from China to Taiwan; another of his own parents’ volunteer work leading members of their communities on trips to the concentration camps in Poland. Still others described the experience of learning they were Jewish as young adults. A host of memories—about loss, about violence, about family and personal history—emerged from their hearts as we considered the complexity of memory itself and its relationship to place. After Treblinka, we took a nighttime walking tour of Warsaw, and began to consider the idea of reconstruction. 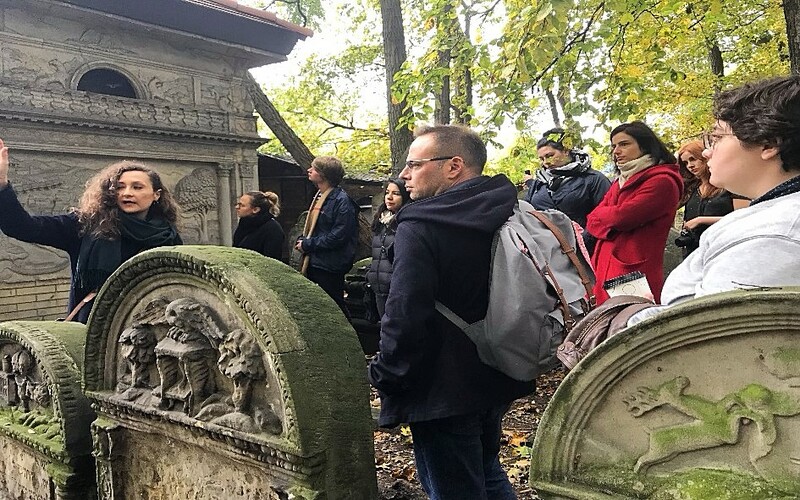 We learned from NGOs led by ethnic Poles who had restored Jewish cemeteries in small towns across the country. Their tender stories of reconciliation moved us and helped to heal our experience of the “place” of the Holocaust we’d so intensely visited. We spent our last day in the beautiful Jewish Cemetery of Warsaw, situated on the edge of the Ghetto. A wooded, sacred, living place—with the sun dappling through the fall leaves—it lifted our hearts and calmed our spirits. Every moment of our trip was an opportunity for learning, for contemplation, for dialogue. It was everywhere evident to me what it means for students to discover history with their own eyes and ears, with caring and curious professors directing their attention gently. As one first-year student put it, “in the beginning I wasn’t sure what cultural memory meant. The readings confused me a little, because they were very philosophical. But today, standing here in this place, I understand the whole idea of our course.” For those going back to write term papers on a chosen place or artifact of culture memory, this trip was a hands-on, hearts-in experience of Polish memory and memorialization of the Second World War. I have been thinking a lot lately, and even more so since that trip, of what tools we need to ensure that we can better hear one another across our differences in a globalized world. It’s not a long way, alas, from an exploration of Nazi Germany and once-occupied Poland to current efforts to silence a free press in multiple places on earth. For that reason, I am myself a strict believer in the first amendment right to free speech. Once we begin down the path of censorship, it’s a slippery slope. You might want to take a look at this article on the University of Chicago’s strict free speech policy, as described by its principled president Robert Zimmer. At AUP we pride ourselves on holding “fierce conversations” inside and outside the classroom. No safe rooms with puppies and cupcakes here. This means, of course, that sometimes we will hear things we don’t like. Students need to experience a full range of perspectives, ideas and approaches, ideologies and creeds, precisely so that they can make up their own minds and articulate their own values. Only by knowing what you hate can you defend what you most love. We at AUP believe that our students should be pushed beyond their comfort zones, that it is the long gift of a college education to learn to sort through complex and contradictory ideas in search of one’s own specific and personal beliefs. As you know, we call our students and alumni at AUP global explorers and that metaphor has been showing up everywhere when people are talking about innovation, creativity, the liberal arts, and life opportunities for graduates. Alex Pentland, the former director of the MIT Media Lab, quoted in a book called Social Physics, writes: “The most consistently creative and insightful people are explorers. They spend an enormous amount of time seeking out new people and different ideas, without necessarily trying very hard to find the “best” people or the “best” ideas. Instead they seek out people with different views and different ideas.” You might also enjoy this delightful article from The Wall Street Journal on Leonardo da Vinci, whose special talent was precisely not being an expert at anything in particular, bringing his whole exploring soul into play across disciplines, bodies of knowledge, and media. The end of the article makes the link between our brand of education and Leonardo’s curiously ranging mind. For all those in the AUP community, there is also a new book by George Anders, called You Can Do Anything: The Surprising Power of a “Useless” Liberal Arts Education. The first chapter of that book is called, you guessed it, “The Explorers,” chronicling how a student who majored in anthropology invents, through a series of twists and turns through IT and law school, a new career in one-one-one, Skype-conversation global marketing research for the online store Etsy. Finally, let me leave you with a video of actual AUP explorers on a trip to Iceland for a global communications course called “Place Branding: Travel, Tourism and Competitive Identity.” Click on the photo below to see the video. To our alumni--Please let us know when you come to Paris and stop by for coffee or a tour of our renovated campus. Our Alumni Affairs Office would love to hear from you. Global Talent Brochure - Spring 2018! The AUP e-newsletter is now available for September/October!